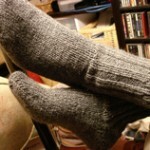 Another pair from the pile of socks-in-progress is done. And this one meets two goals. I took notes on sock one so I could reproduce it on sock two. And, I’ve finished another 2005 MDSW yarn purchase. 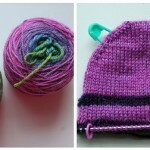 The tubular bind-off was fun but took some practice. The second step (when you’re going through stitch 3 purlwise, while stitch 2 is still on the needle) needed to be looser than I originally thought. 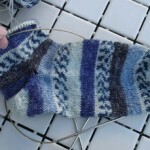 I had trouble making it loose without being loopy until I started stretching the ribbing after performing each step. I just did a quick stretch and it really seemed to make everything look nice and smooth — and stretchy. I love these socks so much that I’ve already worn them twice in just a few days. I washed and dried them inside out and they did just fine in the laundry. Their first wash definitely softened them up a bit too. Great socks Jody! Why don’t you try the Turkish Cast on next time! It’s so much nicer than the figure 8!! Love those socks! 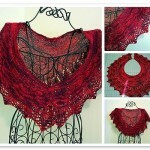 I can’t wait to try a tubular bind-off. They are lovely! Great job! Love the simplicity of the increases! hurrah for new socks! they are gorgeous! india is one of the few self-patterning colourways i like, and i curse myself for not having discovered it before it was discontinued. Gorgeous color. They look fabulous! Love that bind off! What is your source for it? Those socks are gorgeous! What lovely colors. Beautiful socks! Those are the best short row heels I’ve ever seen. 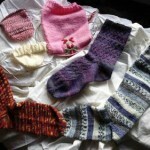 Makes me want to try some toe up socks soon. Thanks for the great pics. Good job! I hate the tubular bind-off, it seems to take forever. But the results make it worthy of the time. Those look great. Congrats on another FO. Oh, I love them! What a great yarn! Tweedy and stripey…great socks. I like the soft pinks and reds. Very soothing. where do I get the ADDI needles in India ? Can any one suggest ?